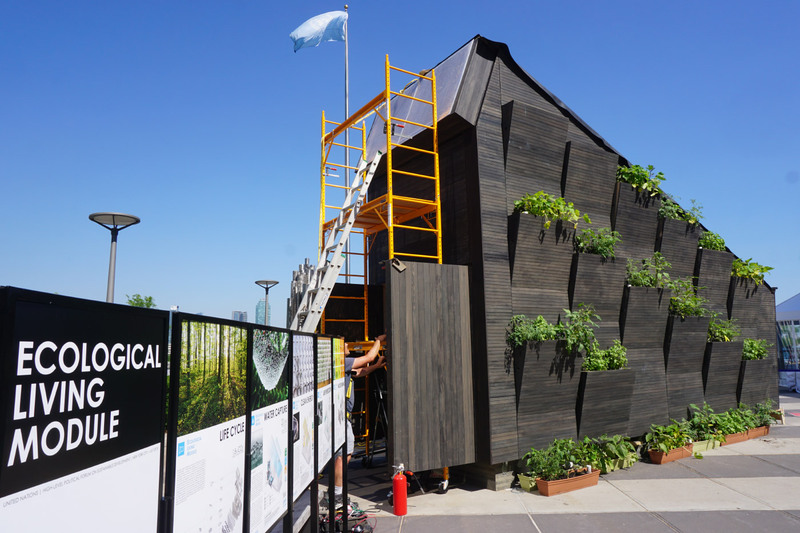 Yale University and Gray Organschi Architecture have designed and built a self-sufficient tiny house for UN Environment and UN Habitat, and the building is on display in UN Plaza in Midtown Manhattan until August 11. The Ecological Living Module contains 215 square feet of occupiable interior space and carves out another 16 square feet for a rear mechanical closet. 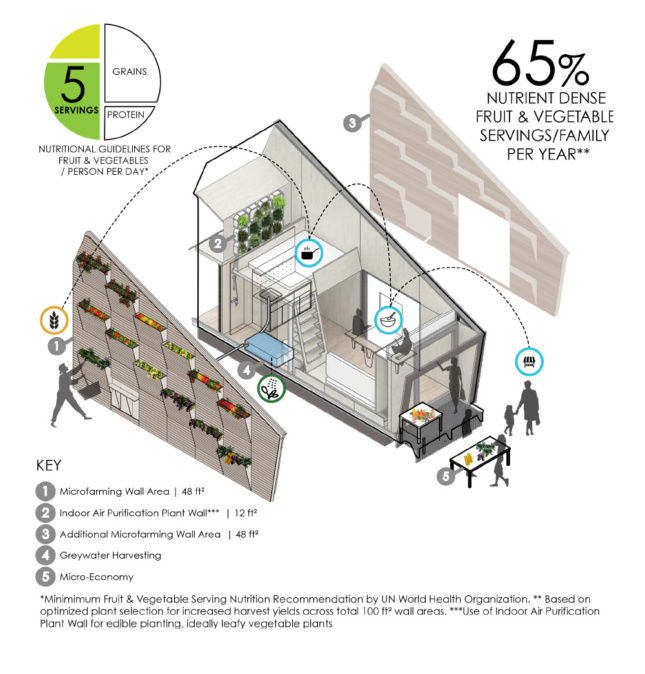 The unit uses passive lighting and moisture collection, structural cross-laminated timber (CLT), food-growing green walls, and sun-tracking solar panels to shrink both the building’s embodied energy and resource needs. According to UN Environment, housing construction worldwide uses 40 percent of all resources produced every year and accounts for one-third of greenhouse gas emissions (not to mention the conflicts being fought over rapidly dwindling materials like sand). The module was commissioned just in time for the United Nations High-level Political Forum on Sustainable Development, to illustrate the idea that sustainable urbanization can only be accomplished if buildings minimize their contribution to climate change. The Yale Center for Ecosystems in Architecture and Gray Organschi worked together to design and install the module in only four weeks. The building was fabricated partially in New Haven and partially in Brooklyn and assembled on the UN campus amidst heavy security and tight construction restrictions. 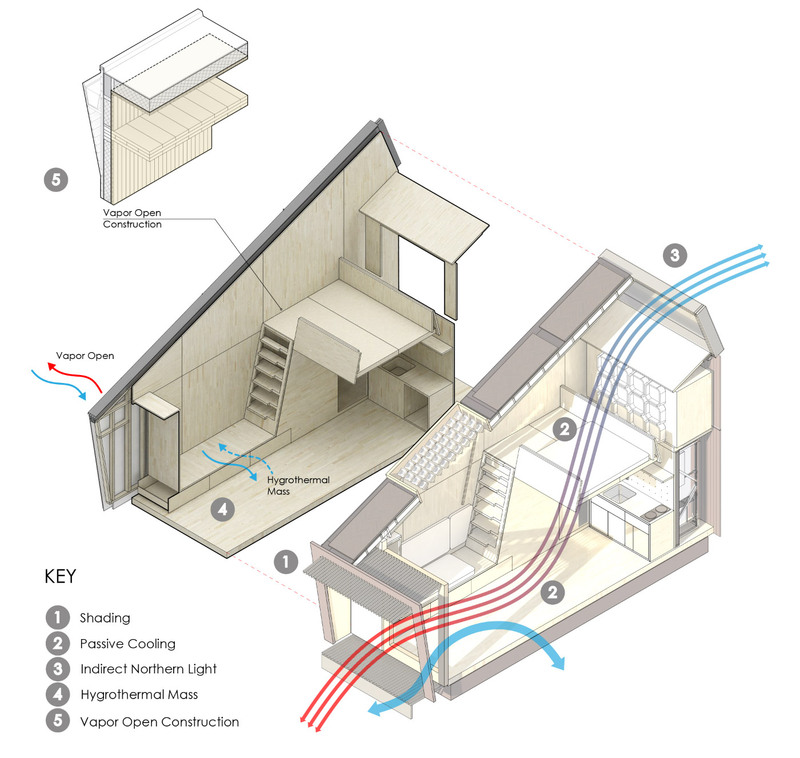 In order to balance maximum sun exposure with thermal comfort, the module was designed with New York’s specific micro-climate in mind. The dramatically-sloped building is clad in dark cedar planks and is home to two cascading “farm walls”, one on either side, and Gray Organschi claims that in New York the home can produce over 260 servings of vegetables. Plants were used inside as well in the loft area, and a living wall in the upper loft area purifies air for the inhabitants. “Structure was used as finish,” explains Gray Organschi founding principle Alan Organschi. The same pale CLT used to support the building was left exposed inside to create all of the finished surfaces, from countertops to stairs. The timber was sourced from the northeastern U.S. and sequestered more carbon than the effort used to harvest it. The team optimized daylighting in the building by carving strategic cuts into the back and roof. 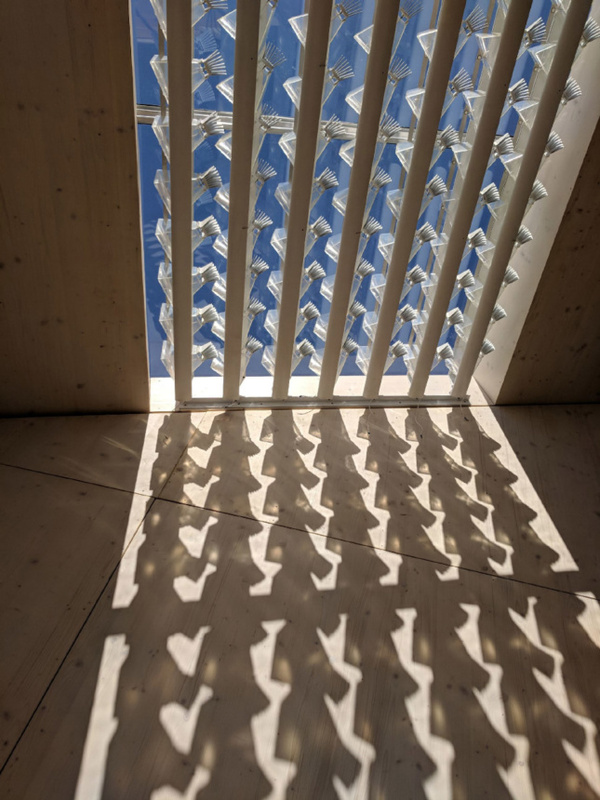 An Integrated Concentrating Solar Facade was installed to both reduce the amount of incoming sunlight and harvest solar power; an array of tiny panels track the sun’s movement and focus light on the minimally-sized solar receivers. The team wanted to build a system that could be assembled with the least amount of effort, and that would use the minimal amount of toxic materials to create. 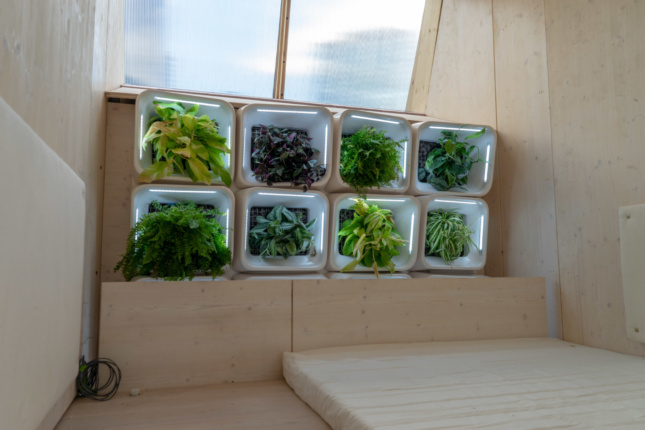 After August 11, the Ecological Living Module will be partially disassembled and brought to San Francisco; the structure was built narrow enough to be towed by truck. After that, the module will be flown out for demonstration in Quito, Ecuador, and then Nairobi, Kenya.